The Royal Family of Reggae, Morgan Heritage, have released their newest album, Strictly Roots. The album, which has been available for pre-order since March 10th, 2015, has reached #1 on the iTunes Reggae Chart, and the first single, “Perform And Done” has received substantial rotation on commercial radio. The album is available in retail stores nationwide including Best Buy, Target, Walmart, and Barnes and Noble. Purchase Strictly Roots on iTunes, here: http://apple.co/1zzk8II or on Amazon, here: http://amzn.to/1OyYCe8. Morgan Heritage recently premiered “Wanna Be Loved” (ft. Eric Rachmany of Rebelution) with ThePier.org. On working with Morgan Heritage, Eric Rachmany of Rebelution told ThePier.org, “It’s an honor to collaborate with Morgan Heritage. In my eyes they are one of the best Reggae bands of all time. Their style is like no other out there and their story is remarkable. They sent me ‘Wanna Be Loved’ and I immediately connected with the concept that each and every one simply wants to be loved for who they are.” In addition, Morgan Heritage previously partnered with Billboard.com to premiere the video for their first single, “Perform And Done,” as well as working with Yahoo! Music to premiere “So Amazing,” the second single off the album. 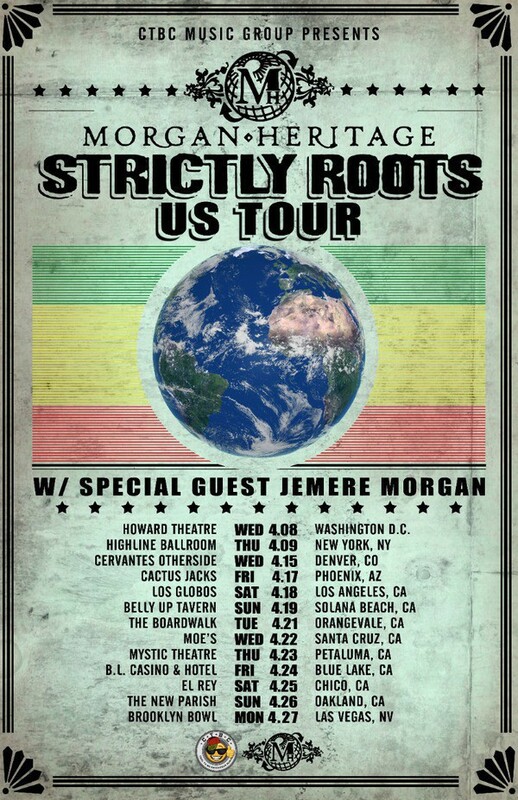 Morgan Heritage, which has established themselves as the premiere live group on the reggae circuit, is currently on tour in support of Strictly Roots. The tour also features third generation ambassador from the Morgan family, Jemere Morgan, as a special guest. In addition, Oxfam, an international confederation of 17 organizations working together with partners and local communities in more than 90 countries, will be on site for select shows on the Strictly Roots tour. Regarding the partnership, Oxfam’s Outreach Project Manager, Bob Ferguson, added, “Oxfam America is pleased to be joining forces with Morgan Heritage and their fans to help right the wrongs of poverty and injustice. Oxfam believes that music can change the world, and we are looking forward to working with The Royal Family of Reggae to help make some positive and real social change.” For more information, please visit www.Oxfam.org.